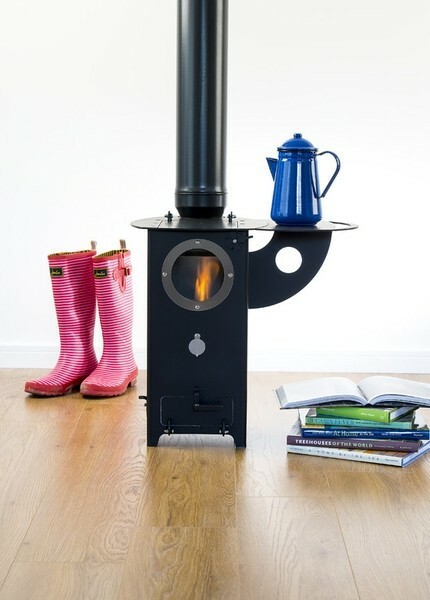 The Chilli Billie Stove is a little stove with a big heart, small but mighty, a flaming wood rocket, a tree fuelled engine. It is top loading with a round glass window which you can see the fire through. You can boil a kettle on the top surface of the stove. The kW output is between 2.5-3kW. There is an optional detachable side shelf which is useful for putting your kettle or pans on when not boiling. There is a boost disc on the front which can be used for lighting the stove. It is ideal in small spaces like camping pods, yurts, beach huts, shepherds huts, sheds and studios but can also be used in homes. It is vital that the distances from combustible surfaces to all surfaces of the stove and flue pipe both inside and going through a roof are strictly adhered to and smoke and carbon monoxide alarms are fitted. The exceptional guarantee on all Chilli Penguin stoves is valid when your stove is purchased from an approved stockist like ourselves, and your stove is installed by a HETAS approved engineer or has been subsequently inspected and approved by the local Building Control department if installed by a non-HETAS approved engineer Chilli penguin stoves are made to order so there will be a wait for delivery. This will vary, depending on the time of year, between 2-6 weeks. Chilli Penguin stoves are available in a six different colours – black (no cost), or charcoal, storm blue, Mojave red, almond white and forest green – all at +£60.